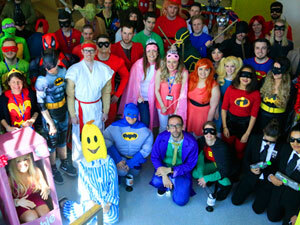 Superheroes can come in many forms – some fight crime, some raise money for charity (like the superheroes at Key 103’s Cash for Kids charity, which we’re dressing up in support of today) and some are Ed Miliband’s beard. They just are. This week we’ve been talking about why the security threat is at its realest, and why Manchester could be the next Silicon Valley. We’ve also been sharing how you can cash in on ecommerce excitement and why money is definitely not the best motivator. Finally, we’re tackling the skills gap and laying down some knowledge on the scary consequences of security breaches. Three months after a mega cyber attack hit an account held by Bangladesh’s Central bank at the Federal Reserve Bank of New York, a warning has been issued of a second attack of a similar nature. Attackers took £56m the first time around and according to the team that issued the warning, this latest incident shows that the Bangladesh heist was not a single occurrence, “but part of a wider and highly adaptive campaign targeting banks”. Information hasn’t been released about the second attack aside from that it was a commercial bank. Justin Harvey, chief security officer at Fidelis Cybersecurity said: “Those with powerful access rights within an organisation are an easy target for hackers and, if compromised, this can have a devastating impact on any company – financially and in terms of reputation”. To help protect yourself, make sure you have good security practices in place, only give access appropriate to each member of staff, and ensure that everyone is trained in security procedures. Barclays has developed a contactless payment system for Android smartphones to rival Apple Pay which should be coming your way in June 2016. If you’ve been living in a hole and don’t know about contactless payments (which includes me because I can’t get my bank to give me it for love or money), it allows you to pay for goods and services on contactless terminals. A blogger in New York has managed to use public data to prove that the NYPD ticketed thousands of cars that were legally parked. Officers kept ticketing the blogger – Ben Wellington – on the parking ramp near where he live, which was, unsurprisingly, pretty motivating. In the wake of the findings the NYPD wrote to Ben saying he was right and messaging the officers to clarify the rules. To get the info, the blogger looked at publically available data in NYC’s Open Data portal, which told him whereabouts in the city people were ticketed most often. He then checked Google street view to see whether the tickets were justified. Ben hopes his success will empower others, although it may just end up being wishful thinking in the case of many.